If you haven’t had your caffeine yet…you don’t need it. I have something to wake you up. 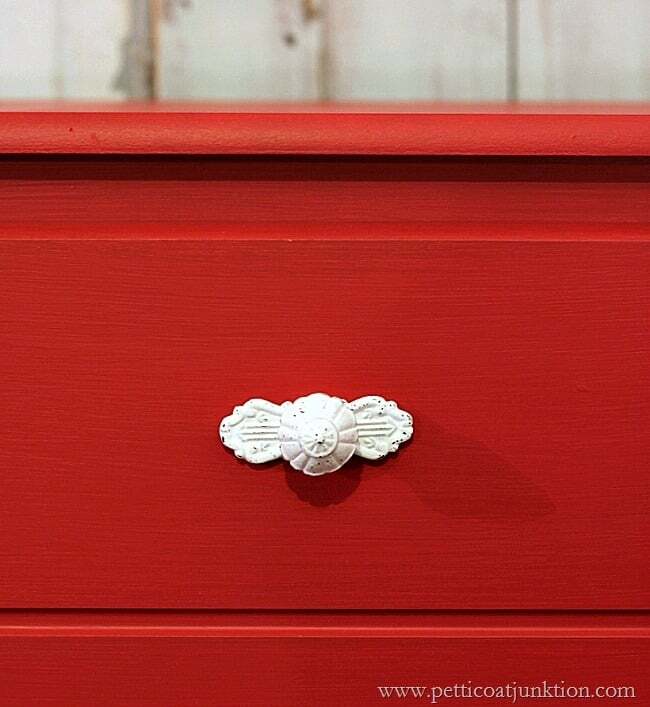 The painted furniture theme of the month is red and we have some beauties for you. This piece is constructed of fiberboard and metal drawer rollers. It seems to be pretty sturdy though and it looks much better now. I picked out different pulls in Hobby Lobby but there wasn’t enough in stock….I needed nine! These are ok but definitely not what I was going for. The color is Behr Candy Apple Red. I had the color mixed in the matte finish. When did they start calling it matte instead of flat? These photos don’t do the chest justice. I set up the photo shoot inside the workshop because it was darn cold outside. For more RED inspiration click the photo links below…and have a great day! I’m sharing all things Christmas on Facebook, Instagram, and Pinterest for the next few weeks. What a stunner!!! I am just loving this theme. 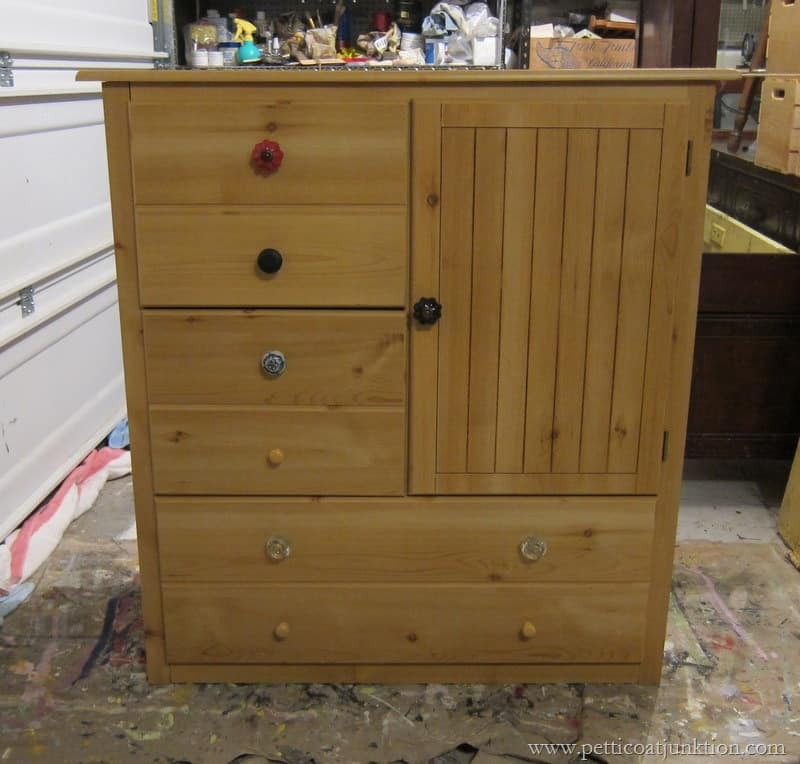 Your piece is gorgeous and I love the white knobs with it!! Love that cheery color on the cabinet! I am also jealous of anyone who lives near a Hobby Lobby! We have to drive over an hour each way to ours..but it’s worth it for the knobs alone! We have almost 2 feet of snow here. I feel your pain on photographing in the cold dreary weather. 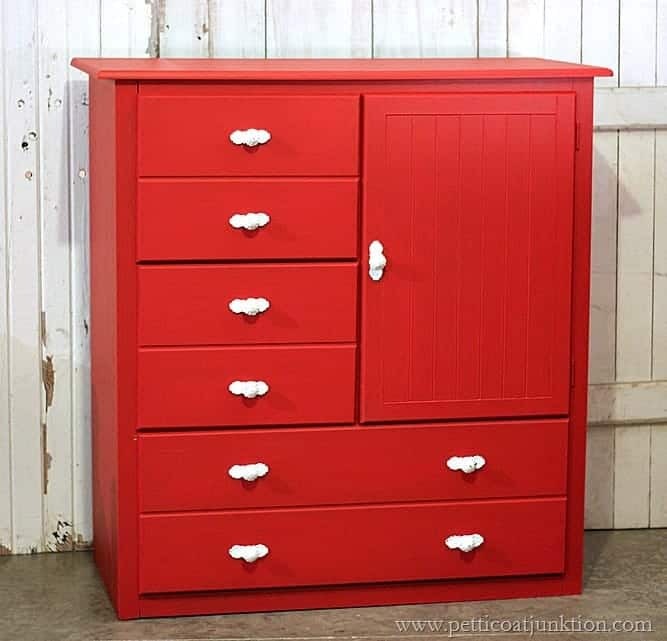 What a difference that red makes on that cabinet. Lovin me some apples! Great color and fantastic makeover, Kathy! This is a really pretty piece and I love the contrast of the white hardware. 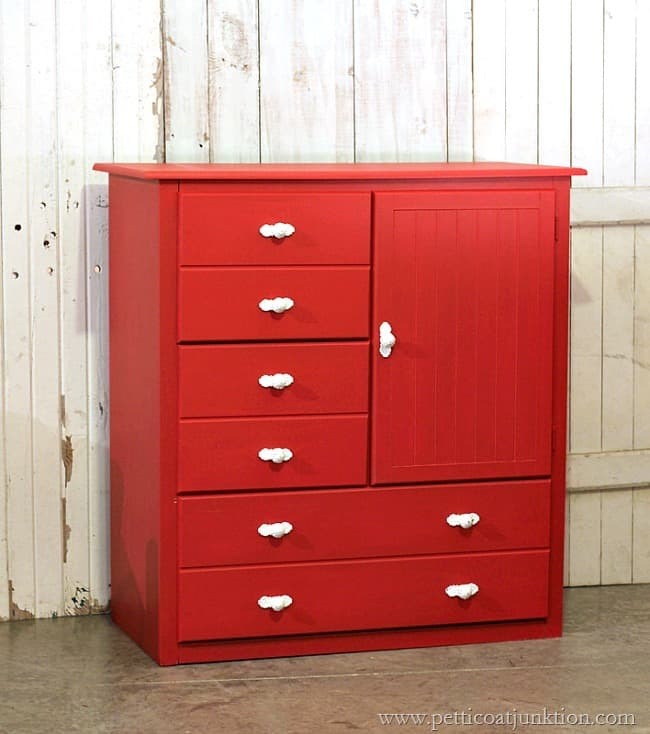 Love the red, I don’t know what it is about a red piece but it just adds some pizzaz to a room and can go with any style, primitive to modern. Looks GREAT Kathy!!!! I love the red you picked! Love the red and love the white knobs!! It does look sooooo much better! Great job! And yes, it is cold here in the south too!! !